New improved Surgi-Cream Facial Hair Remover is formulated for those with sensitive skin. 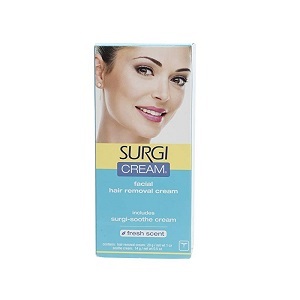 Surgi-Cream is a quick, effective and gentle way to remove unwanted facial hair from upper lip, cheeks and chin. Smooth on Surgi-Cream Hair Remover, relax for a few minutes and rinse away Surgi-Cream works in as little as 4 minutes.